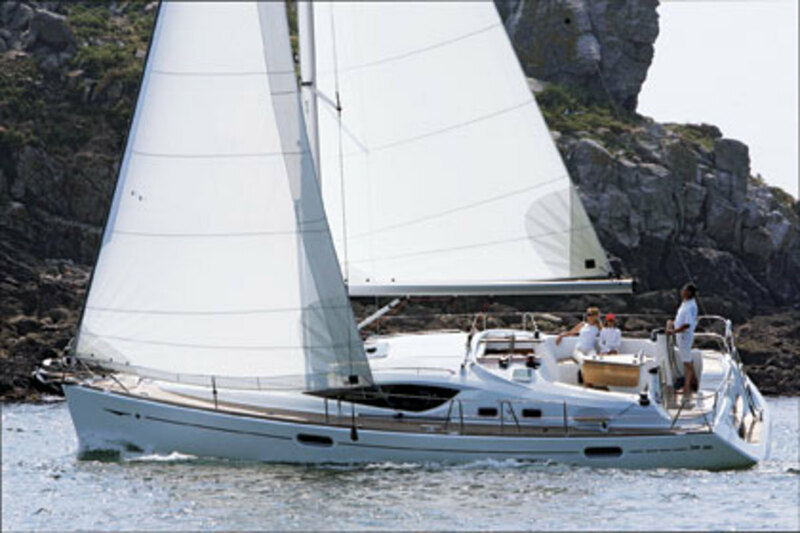 Jeanneau helped to revolutionize the deck-saloon aesthetic when it launched the curvy and distinctive 54 DS about five years ago. The orders rolled in, the company soon realized it was on to something, and 49- and 42-foot models followed. The most recent deck-saloon launch, the 39 DS, is probably about the minimum length for this popular layout and is designed to provide, in a smaller package, the features its bigger sisterships provide. The freeboard is necessarily high, but the curvy line of the deck saloon makes the boat attractive. I took one for a spin in 15 knots of breeze on Chesapeake Bay. The hull is built of solid hand-laid fiberglass with ISO gelcoat and a protective barrier coat to resist osmosis and is strengthened with a fiberglass grid reinforced in high-load areas. A system of limber holes ensures that all bilge water ends up in the sump. The deck is built using Jeanneau&apos;s resin-injection "Prisma process" with end-grain balsa core and ISO gelcoat. The electrical and plumbing lines are neatly bundled and secure. The engine compartment opens from all directions, yielding reasonably good access to the "new-generation" Yanmar diesel. Like all jeanneau boats, the 39DS is built in their factory in Les Herbiers, France. jibsheet winches. Sight lines from the helms are excellent. The raised saloon gives fine visibility and lots of light in the main living space. Tankage is mounted low under the cabin sole to help provide stability. The berth in the forward cabin is comfortable, and the broad stern sections create space for the galley, head, and a big aft cabin with a double berth that should accommodate even the most restless of sleepers. The interior spaces attractively combine satin-varnished teak, off-white fiberglass, and leatherlike upholstery, all illuminated by plentiful ports and hatches. I liked the galley, with its L-shaped layout, open counter space, and high-quality appliances. There&apos;s only one head compartment, a wise design choice in a boat of this size, and it has plenty of overhead clearance for tall sailors. In all, this interior is a truly pleasant environment. The only issues are that the forward bulkhead cutout leaves a small threshold in the forward-cabin passageway, and there&apos;s a small step down going to the aft cabin, both of which could trip up the unwary. Our 15-knot breeze produced plenty of heel while going to windward; for cruising I might reduce the working-sail area before this point to keep the family comfortable. There was noticeable weather helm in puffs. The 39 DS tacked through 90 degrees in these conditions and gave a lively, fast ride at about 8 knots. The hull is not just a shortened version of the company&apos;s original 40 DS, but comes from a completely new mold that is shared with the aft-cockpit 39i. I thought this new boat was a bit quicker than the earlier models. A 2,500 rpm setting yielded 7.4 knots and moderate noise level in the saloon. Full throttle drove the boat to its theoretical displacement hull speed (around 8 knots). The turning circle under power was just over one boatlength, and close-quarters handling was excellent. 6&apos;5", forward cabin 6&apos;1" » Bunks: Aft cabin 6&apos;6"×6&apos;5", forward cabin 6&apos;7"×6&apos; » Settees: 7&apos;2", Cockpit seats: 5&apos;10"×1&apos;9"
in-mast furling mainsail, 122% jib, standard winches, windlass, ground tackle, 6 mooring cleats, and teak interior. The hull is sturdy, the cockpit is well laid out, and the interior space is comfortable. Engine access is excellent, and the boat is capable of sailing at 8 knots. There are little things (like thresholds at the bottom of the forward bulkhead) that may take a little getting used to, but all in all, the 39 DS is a well-made mid-size cruiser that complements the Jeanneau range of deck-saloon designs.